ETs Looking For A Place To Park? 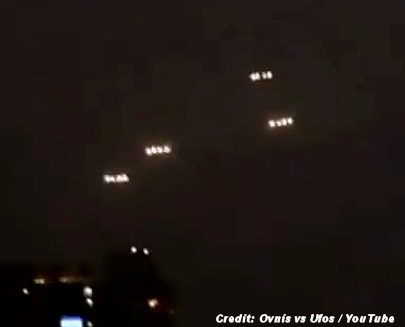 Some highly unusual groups of aerial lights appeared over Santiago, Chile, in December, and while the exact date of the incident isn't known, a video caught the objects moving around in very interesting patterns. After looking at the two-part video, it's easy to wonder why only one person captured the event and from only one vantage point. According to the Daily Mail, an unidentified woman videotaped the lights from her window while she and others are heard excitedly talking about what they're seeing in the sky. The first two minutes show four long strips of hovering multiple lights (seen above). Then, one by one, the strips move slowly away from each other. As they do this, you can see smaller, flashing lights on each of them -- they look almost like aircraft on a landing trajectory to an airport.